I can’t get over how much I love my air fryer. I was skeptical at first, but the food is so delicious and I don’t feel guilty for eating it! These falafel bowls are so versatile that you can’t go wrong. They work great as a dinner or even an appetizer/snack for a party or a lunch! Falafels in the air fryer taste like they’ve been deep fried: they have a crispy outside and and soft and delicious inside. It’s amazing how the air fryer uses hot air and you don’t need oil to get the same taste! 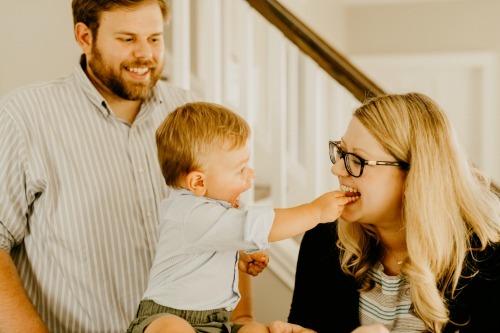 I don’t know about you, but I have some picky family and friends. Some are gluten free, others doesn’t like meat, some like spicy food, some don’t, and the list goes on. So, any time I get the chance to make a flexible dish that people can “create their own,” I do it! These falafel bowls fit the bill. AND, they are a great dish for the new year because they are a great healthy menu item as well. These falafels can be modified to practically any diet or preference (if you are gf use gf flour and use gf pita, if you like things spicier, add a pinch of cayenne). 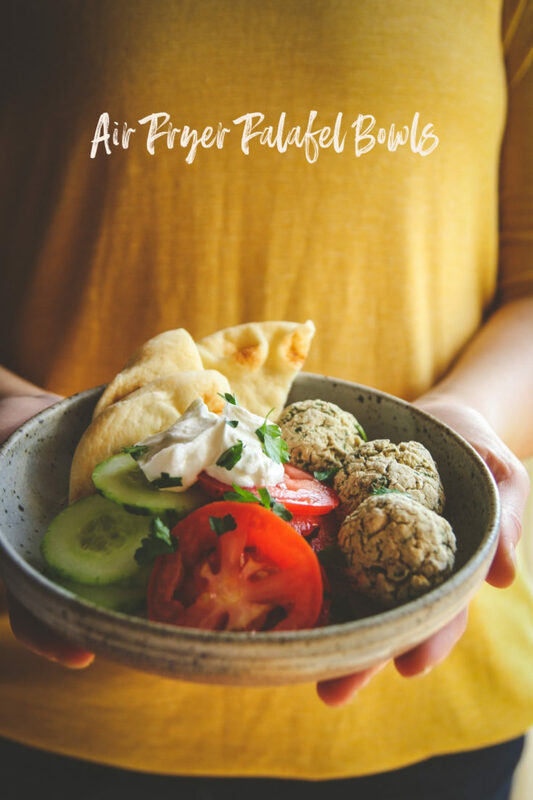 This air fryer falafel bowl recipe comes together in a flash. So, how do you make Air Fryer Falafel Bowls? A few quick steps and you’re on your way to a delicious healthy meal. 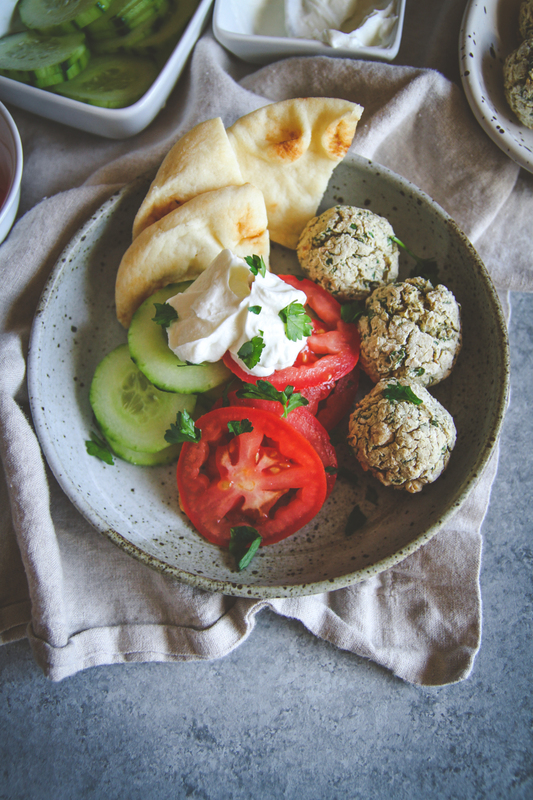 Arrange falafel bowl with ingredients you like (I love doing tomato and cucumber slices, pita wedges, fresh herbs, and Greek yogurt – these bowls are also incredibly delicious when served with tzatziki). 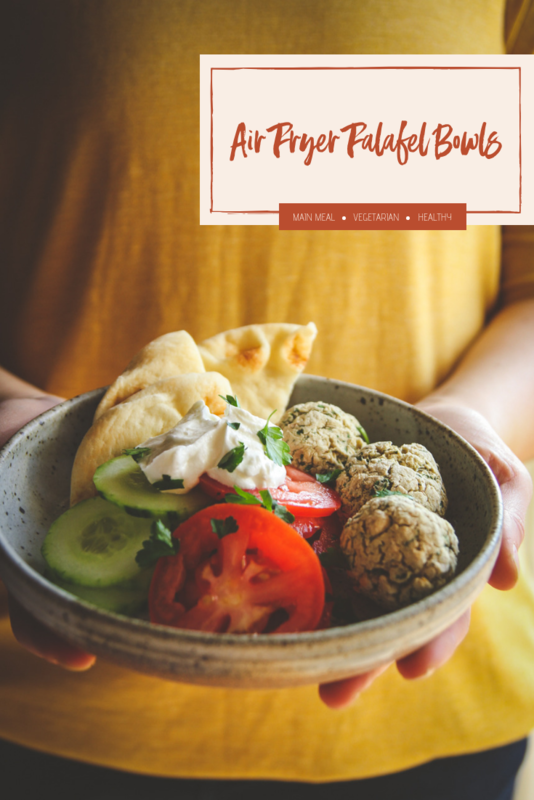 Air fryer falafel bowls are super easy and delicious and because they're made in the air fryer, this vegetarian recipe is healthier than the fried alternative! 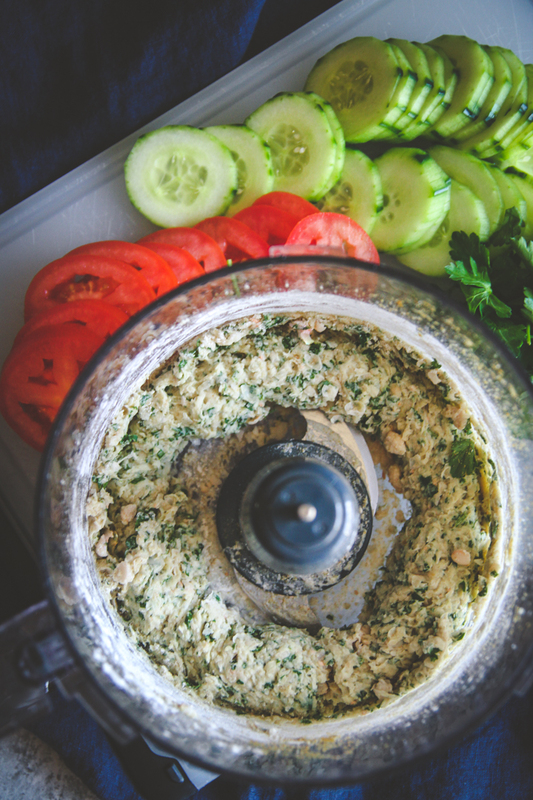 In the bowl of a food processor combine ingredients for the falafels (chick peas, self rising flour, parsley, garlic clove, cumin, and salt). Process for 15-25 seconds, until no more whole beans can be seen (the mixture can be coarse and doesn't have to be a smooth paste). 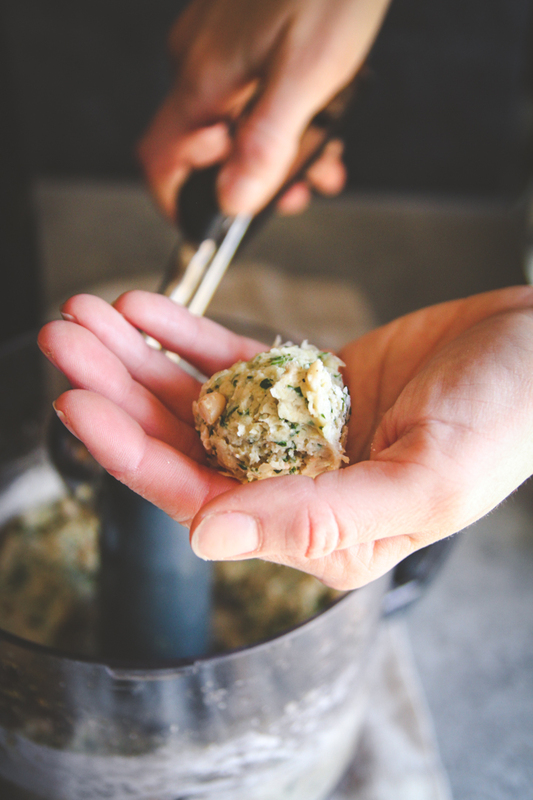 Using a cookie scoop or a spoon, form 1.5 tablespoon balls of the falafel batter, rolling the batter between your hands to form balls. 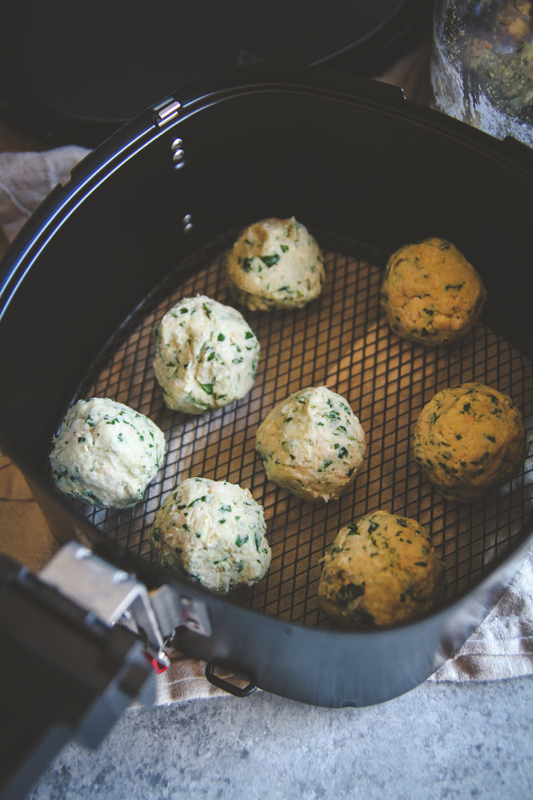 Spray the bottom of an air fryer with cooking spray and place falafel balls in the basket of the air fryer in a single layer. Cook the falafel at 350 for 10 minutes, rotating the falafel halfway through cooking. You can spray the falafel themselves with a little cooking spray for a nicer looking/crunchier finish. 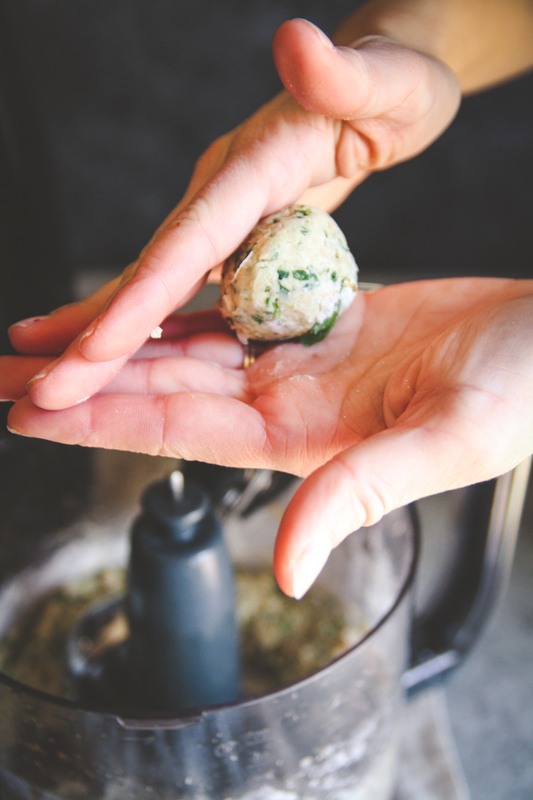 While the falafel are cooking, prepare the other bowl ingredients. 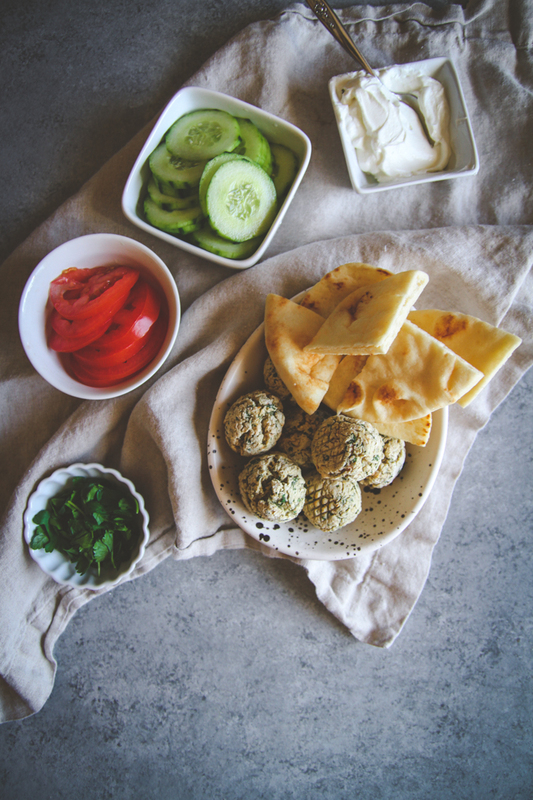 When the falafel are done cooking, assemble the bowls: divide the falafel between 4 bowls and serve with pita bread triangles, tomato slices, cucumber, greek yogurt and top with a sprinkle of fresh parsley and enjoy! If you don't have an air fryer, the falafel can be baked on a cooking spray lined sheet pan at 375 degrees for 15 minutes, or they can be fried in canola oil (bring 1-2 inches of canola oil to a slow boil in a deep saucepan or pot, carefully lower in the falafel balls and fry for 2 minutes, then flip with tongs and cook for another minute, or until balls are golden brown). If serving hungry adults, I'd suggest doubling the falafel ingredients, the recipe makes about 2-3 falafel per serving, the entire recipe makes 8-12 falafels (depending on the size you roll them), there have been times when I have eaten 4 falafels myself because they're so good. I want to try these in my new air fryer but i cannot find the falafel recipe. Do i need to drink another cup of coffee? I will also try the cheesy chicken very soon. Yes that second cup of coffee helped😁 can I use a can of white beans instead of garbanzos? We are having an ice storm in Massachusetts. Hi Donna, so glad you found it! And YES definitely you can use a can of white beans instead of garbanzo beans, I’ve done that many times!